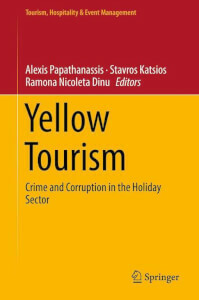 The Βοοκ "YELLOW TOURISM Crime and Corruption in the Holiday Sector" published by Springer International Publishing, is a follow-up to the 1st International Conference on" Yellow Tourism "(Tourism and Crime) organized by the Ionian University (Ionian Academy) April 27-29, 2017, addressing every form of threat and challenge to the tourist product from criminal activities. It approaches tourism as both a globalised business impacting the livelihood of millions of people, and a highly challenging field of action for national legislators and law enforcement agencies. The global nature and ubiquity of tourism, as well as the core elements of the holiday experience - such as interactions with unknown environments and places, a care-free mind-set, novelty-seeking behaviour and anonymity - render it highly susceptible to victimisation, crime and corruption. Accordingly, the book addresses a comprehensive set of emerging issues, including: conflict and fraud during holidays; criminal and negligence offences at tourists’ expense; exploitation and mistreatment of service workers; deterioration of heritage, cultural and natural resources; and securitisation of tourism. The program is operated by three academic research units a) the Laboratory of Geopolitical Analyzes of the Department of Foreign Languages and Translation (b) Cruise Management & eTourism at the University of Bremerhaven, Germany, and the Economics School of Ovidius University of Constanta, and is coordinated by Professor Stavros Katsios, Professor Alexis Papathanassis and Professor Ramona Nikoleta Dinu respectively. The consortium of "Yellow Tourism" aims to put the nexus of crime and corruption on the international research agenda by expanding the interdisciplinary nature of tourism research and cultural heritage management.